“MusicPal” is a new WiFi-enabled Internet radio from Freecom. 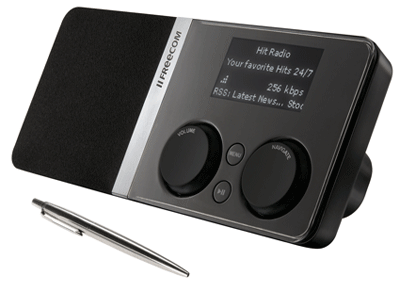 Designed to be an updated version of the kind of portable radio you might have in your kitchen or by your bedside, the device can access over 5,000 Internet radio stations, stream music from your PC or Mac, as well as operate as an alarm clock. But, perhaps most interestingly, news headlines and whether reports (pulled in via RSS) can be displayed on the device’s LCD screen. The MusicPal comes wih a subscription to vTuner and also accesses the ShoutCast Internet radio service. What sets the device apart from other streaming music boxes, is its portability and built-in speaker. In fact, in looks and functionality it’s very similar what a portable Squeezebox might look like, especially with those RSS headlines scrolling across the screen. As a bonus, users can also plug the MusicPal into their Hi-Fi system, as the device has an audio out. Priced at 139USD, the MusicPal should start shipping next month. Good timing for a launch, now that Internet radio isn’t on death row. The pricing is extremely reasonable, though without Pandora support I’m not sure I’d be interested. Also, as much as I love the idea of scrolling RSS feeds, I find I really don’t use them on my Squeezebox. Maybe this display is more suitable for the application, but it doesn’t look like it. I think we’ll see more and more devices with RSS feeds (and other widgets) included, but no one’s got the interface down yet. I agree — the RSS feeds are fun on the Squeezebox, and will be on MusicPal, but the screen is too small to really be useful beyond catching a sports score or breaking news headline. I also agree that the pricing is very reasonable for the MusicPal. If my house didn’t already stream iTunes to every room but the bathroom, I’d buy one. Hang on a minute, there’s an idea!